After update to iOS 9, most people have problems about the new iOS 9, such as apps in iOS 9 cannot be used normally, so some people want to downgrade to iOS 8 before Apple stops signing iOS 8 code. Be careful before downgrade to iOS 8. If you do something wrong, you will lose everything from your iPhone/iPad/iPod Touch. Here, I have listed some steps for you to successfully downgrade to iOS 8 after update to iOS 9. It is necessary and important for you to have a full-scale backup for your iDevice before downgrading to iOS 9. You can use iCloud, iTunes or iFoneBackup to do the backup work for you. You can read the following article to learn more about how to back up your iPhone/iPad/iPod Touch with the three software in details. First, you need to download iOS 8 IPSW firmware. You need to download an iOS 8 IPSW firmware file. The firmware should be specific to your device. You can search IPSW firmware on sites like www.ipswdownloader.com. If your device does not have iTunes, then download and install it. Next, please put your device in Recovery Mode. Launch iTunes and then connect your iOS device to the computer or Mac via a USB cable. Enter DFU mode by pressing and holding on the “Power” and the “Home” button at the same time holding them for 10 seconds. You then release the “Power” button but still hold on the “Home” button until you iOS device gets detected through a recovery mode in iTunes. Then, downgrade to iOS 8. Hold down the “Option” Key if you are using Mac or the left “Shift” key if using Windows and then click on the “Restore iPhone” button. From the pop up window, choose the firmware that you had downloaded in step one and then click on the “Open” button. To continue with the restoration process click on the “Restore” button once more. Once you complete the above steps, just wait for the downgrading process to complete. It should take 10 to 15 minutes and your iOS device will be running the iOS 8 version. After you downgrade to iOS 8, now, you can restore from iTunes or iCloud backup to your iPhone/iPad running iOS 8. If you want to selectively restore data from iTunes or iCloud backup, you can use iFonebox to restore partial data from backup to your iDeivce. Plus, during the downgrading process, if you lost any data, let iFonebox help you: Windows version and Mac version. The above are full steps to downgrade to iOS 8 after update to iOS 9 successfully. You can follow it and if you have any questions, comment here and we will help you. How To Recover Lost Data From iPhone 5s After Factory Reset? How To Recover Deleted Photo Attachments From iPhone 6? 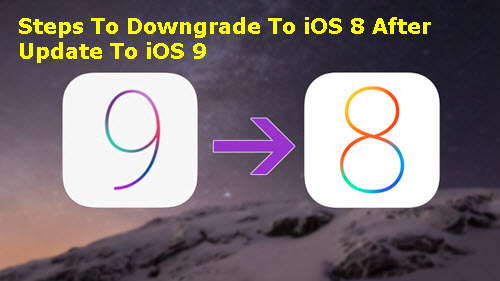 This entry was posted in iOS 8, iOS 9, Tips and Tricks and tagged downgrade to ios 8 after update to ios 9, tips to downgrade from ios 9 to ios 8 by IosdroneD. Bookmark the permalink.